Technext Technosoft has years of experience, and the qualified developers for iOS, Android, Blackberry Apps Development which have been served to many clients all over the globe, successfully . Our Mobile apps aere originally offered for general productivity and information retrieval, including email, calendar, contacts, and stock market, weather information & more. However, public demand and the availability of developer tools drove rapid expansion into other categories, such as mobile games, factory automation, GPS and location-based services, banking, order-tracking, and ticket purchases. our explosion in number and variety of apps made discovery a challenge, which in turn led to the creation of a wide range of review, recommendation, and curation sources, including blogs, magazines, and dedicated online app-discovery services. The demand for end-to-end mobile device Management Services - Mobile Interfaces, Integration with back-end infrastructure such as Web Services, Location-Based Services, Mobile Payment System, Mobile Advertizing, Multimedia Streaming, Mobile Search Engines, on-device portals, etc. We expertise in development of offshore Mobile Application and Java based mobile applications using various high-end technology and tools. Technext Technosoft has a holistic understanding of the mobile industry challenges and has made significant investments to set up a dedicated Handsets & Devices practice. From cross-platform to mobile-web apps, From user-friendly consumer apps to game changing B2B apps, We delivere a broad range of applications. We believe in not just building mobile apps that looks great, but designing experiences for the user. We consult with the client's business to distinguish who the users are and what the client wants them to do. Our team of designers and developers work together to turn your need into a mobile solution with high user experience & usability. Our mobile solutions are sleek and aesthetically pleasing on multiple levels. We understand the importance of crisp and meaningful content in an app's success, so is the compelling imagery and the layout of the content. At Technext, utmost care is taken to maintain the navigation of the most interactive elements easy throughout the app. Have your publication available to millions of people all over the world through your very own branded app. Mobile recruitment website design, responsive website design and mobile website design. The use of hand held devices and mobile phones has grown dramatically within the last few years, and will continue to grow, with new mobile devices being brought on to the market by the huge range of tablets, iPhones, Blackberrys, Samsungs, HTCs and the list goes on. We design both responsive websites and static mobile websites. Responsive websites change their size to fit on the device upon which they are being viewed. Static mobile websites are designed within fixed parameters where the layout and functionality is controlled. Attractive impact on app user. Technext Technosoft is a leading service provider for iPhone and iPad application development and has developed and deployed several world class applications. We are working on iPhone development from last 4 years and all of our applications have consistently surpassed Apple's guidelines, without any rejection. With a team of about more than 20 iPhone app developers working in iPhone and iPad development alone, we have developed & released more than 50 applications so far. We are working with different types of companies, right from the start ups looking to establish their presence to Fortune 500 companies looking to develop world class applications at affordable cost. Technext Technosoft has a team of passionate and creative android app developers. They are technology experts who believe in delivering high performance services to match our clients demand for quality focus and cost effectiveness and turnaround time. 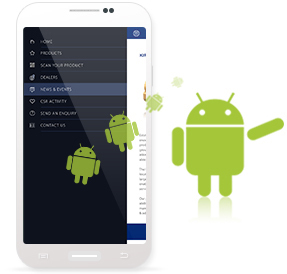 We are one of the industry emerging leaders and specialist in android application development. Technext Technosoft has a team of dedicated developers for Android Application Development, they can take you from concept to launching a production-grade application in a matter of weeks. We provide expert consultation for developing your idea into complete product design. We have been developing android applications that are being used by wide range of consumers ranging from Enterprise users to mass consumers with a highly skilled team of android application developers. At Technext Technosoft, we have a team of experienced and professional Windows Mobile developers who have been developing all kind of Windows Mobile applications under all major Windows Mobile platforms, Our Windows Mobile app developers also have some good experience in porting / migrating Windows Mobile apps to other platforms and also offer app migration / porting services from Windows Mobile to other mobile platforms. Our Windows mobile app and Windows phone app development process is very collaborative and transparent with our clients. We make sure to involve them at every step of the way so that what we design and develop meets their needs and vision. We can develop a variety of custom Windows Mobile applications as per your business requirements and needs. We also have a considerable amount expertise in all the latest and most popular open source mobile technologies and frameworks to provide you with multi platform app development options. The Windows Mobile platform provides developers one of the premier operating systems (OS) to develop smartphone apps on while businesses get the strength, security and support of the Microsoft brand as well as one of the fastest growing app stores to put their mobile app on. With its great UI and user-friendly capabilities, Windows Mobile-based phones are an emerging and strong competitor in the Smartphone market and a good option for mobile app development. Microsoft Windows is, and has remained, one of the most developed on platforms by businesses to date. Due to its large and established user base as well as the OS's user friendliness and familiarity, the thriving mobile version will only continue to be used on more and more smartphones and tablet devices in the future. Those businesses and organizations who develop smartphone apps and tablet apps on the windows mobile platform are likely to realize great benefits both in the short and long term. At Technext Technosoft, we have a team of experienced and professional Black Berry Mobile developers who have been developing all kind of Black Berry application. We promise an astonishing list of features which can be incroporated on Black berry mobile phones.